What I thought was a simple question turned out to be a hard to find answer but was eventually a very easy solution. All I wanted to do was to install a .apk on a new HTC Wildfire S running Android 2.3 without creating/linking a HTCsense or Google account or installing a file manager. This is easily achieved when you know how. 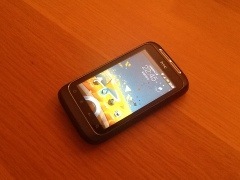 My reason for doing this was that I have just purchased(through the company) 23 HTC Wildfire S, through the HTC Hub app you can create an account, and download a free app called QuickOffice which allows the user to create Office 2003 Word & Excel documents but more importantly open them as attachments. I also wanted to install the Adobe Acrobat Reader app from the Android Market to open PDF attachments, and also the free HTC Flashlight app because it uses your camera led as a torch and can be very useful. Obviously you can download these by a)creating a htcsense.com account to use HTC hub to download apps and b) creating a Google account and using the Android Market, both of which I have done for my personal mobile but didn’t want to do for the company mobiles because I didn’t want everyone downloading apps easily and I didn’t want to create accounts on each phone just to get an app. Now for the instructions, if you have already got the .apk file then skip to Step 3, if not then start here. 1) To get the .apk files we will download the apps on one mobile, possibly your personal one as I did, then use File Expert* to ‘backup’ the apps to the sd card. When you open File Expert go to My Apps and then select the ones you want to backup, and choose backup (If your app isn’t listed you can make it show, just go to preferences to show all apps, but don’t back up apps you haven’t download as they are probably just for your device.). These will then be moved to the sd card in a backup-apps folder or similar. 2) When you have backed up your apps, either connect your phone using a USB lead and select USB disk drive mode or use a card reader to access the memory card. then move the .apk files to your computer, you can then store these to backup your apps, or alternatively follow the next steps to install these on another device. 3) Copy your .apk files on to the memory card of your new phone, to make this easy I renamed my .apk files to 1.apk 2.apk & 3.apk and place them in the root of the card. 4) Now make sure you either disconnect or reinsert the memory card from your pc. 6) Now for the install. Open the Internet browser and enter the following in the address bar, file:///sdcard/1.apk Obviously if you stored your files in a folder or called them something different then change the path to something else. When asked whether to download or play online choose play online, the install screen will now launch and follow the instructions to install your app. 7) When you have finished I personally changed back the setting in Step 5 to make sure others don’t accidentally install malicious apps, highly unlikely but better safe. I also deleted the .apk files off the sd card making sure I had a backup of course. While I have only tested this on a HTC Wildfire S, I would like to know what other devices it works on so if it works for you please let me know in the comments. Please note, this process should not be used to copy apps that you shouldn’t have access to or have purchased, I only used this to copy apps that are free on the handsets I used. I also believe you can use the same method in Step 6 to access any file stored on the sd card. *Although in this article I suggest using File Expert, this is because it allows you to backup more apps from your android device, my preferred file browser on android is ASTRO File Manager which has SMB/FTP access and can also backup apps but I found it didn’t find some apps. On a personal note comments are welcomed as this is my first blog, hope this helps others. I will post other tips/tricks in future not just Android. Nothing can be simpler than this!!! thanks for sharing bro… btw, i am using and htc evo 4G and i’ve been able to neatly install Astro file manager using the command with just one try! I will give it a try. Will the app be installed in the sd card too or the phone memory? works on my HTC Explorer and SE X8. Thanks you it works !! HOW? can u help me with this? Once you have put the files on the SD card, you must put the sd card back in the android device. Then browse to the address in the standard android browser not chrome, this must be done on the android device. The path doesn’t change depending on the drive letter, mine is H: but the file path is still sdcard. If it downloads the file instead of playing online you should be able see it and open it from the Downloads icon the menu. My Droid-X phone was having screen problems and was replaced by Verizon. Unfortunately, I activated the replacement phone before knowing that all my text messages were not stored on the SD card. Once activated, I couldn’t download an Ap installer so I needed to know how to install the Ap after I had it on the SD card. Luckily I found your Blog! Thank you so much for helping me to keep my old text messages since they are a like a time capsule of fond memories. So your Browser technique works great for Droid-X. hi, even i have a similar problem…. can u please help me to install…. i went through the above steps but did not understand, how to give the path?? i tried with file:///sdcard/fm.apk path name, where sdcard is the neme of the memory card, and fm.apk is present inside that…. what does root of the card mean??? i connected memory card via usb cable…. Hi, hope I can help. When you connect your memory card via USB to your computer it will open a window that either shows the files or will give you the option to ‘view files and folders’ select this and you will see the ‘root’ of your ad card this is the top of the card, as you go into folders you go deeper and away from the root/beginning of the card. So just place your apk file here. To install this, open the web browser and enter the path suggested ‘file:///sdcard/fm.apk’ ensure you have followed step 5 first. when i connect the phone through usb, the memory card is opened in ‘h’ drive…. now the name given to the card is sdcard, i.e the name of the drive h is sdcard(h) …..
i copied the ‘fm.apk’ file in the memory card…..
so when we open h drive we get to see the fm.apk file….. there are many other folders in the card like, music, photos, etc etc…..
i enable the required option, i.e step 5…. there is no action it shows “web page not available”…..
please help me to sort this……. Ok, it may not work on your phone, but when entering the address in the browser please ensure that you have disconnected the USB cable to the computer. does it work on cherry mobile w7?? I am using LG Optimus GT540. Due to some complication, my market doesn work and there are no file browsers. When i type file:///sdcard in my andriod browser, the browser says “no internet connection” and stops. Change filename to the name of the file you copied to the sd card, and let me know if you still have problems. What seems to be the problem? What device have u got? For those with a Galaxy S2, you can do a similar thing with a file manager app after changing the phone settings to allow installation of non-store apps. Cyanogenmod 10 comes with a file manager that works really nicely. Once you take it out of safe mode (in the settings) you just navigate to the apk file on your SD card and double-tap it to install. How far can you get or what step do you get stuck on? Does this work on LiveCD iso image of Android 4.2.2 x86? What should i type into browser (internet doesnt work) because apks are on mounted usb flash drive?? Hi, I’m using a Nexus 7 tablet, and trying to install a file I named 1.apk using the google chrome web browser. (I have no file browser to install a file). I am using a Macbook with Android File Transfer to put the file directly onto my Nexus tablet. But whenever I try to install by entering file:///sdcard/1.apk, the browser page just refreshes, with no sign of opening the file or installing it. I would make sure the data is on the sd card, if the nexus 7 has an sd card, not sure it does? Thank you bro !I didn’t had internet access and couldn’t install a single application. U don’t find this information anywhere, thanks for publishing it and wish u good luck ! Firstly I would like to thank you for this endlessly useful tip. I was hunting high and low for a solution to this problem and I found this thread which has solved it for me on the above mentioned device. The reason I really needed a work around to this issue is because I use the device as a non network dependent GPS navigator. What always concerned me is if the device needed a factory reset for whatever reason while I am miles away in a mountain range for example, I would then have no way to reinstall the crucial apps (stored on the sd card) for network free navigation and would therefor effectively be “screwed” for lack of a better word. So…….. thank you, thank you, thank you!! I can continue to get lost in the bush! it suggests it itself but after that there’s no play online or download, something like google search comes up with suggestion, like how to install apk file directly or install apk files using sd card,…. and when you select one browser opens and says internet connection problem. You may not be using the core android browser, it doesn’t work with Chrome or any other browsers that samsung or sony through it. how to install .apk launcher on my phone debuging is off.. i accidentally delete my system launcher.. Think your only option would be to reset your device. If I’ve understood correctly that you’ve deleted the android pal installer. Sounds like a corrupt apk, try downloading again and make sure you download it from somewhere reputable. thank and God bless you. you saved me tonight. it worked for me. Thanx dud .from last 12 hrs am troubling with it..thanx duud u r genius bro.